Please visit our fabulous sponsor this week, Imagine That Digistamp, to see all of their wonderful products! 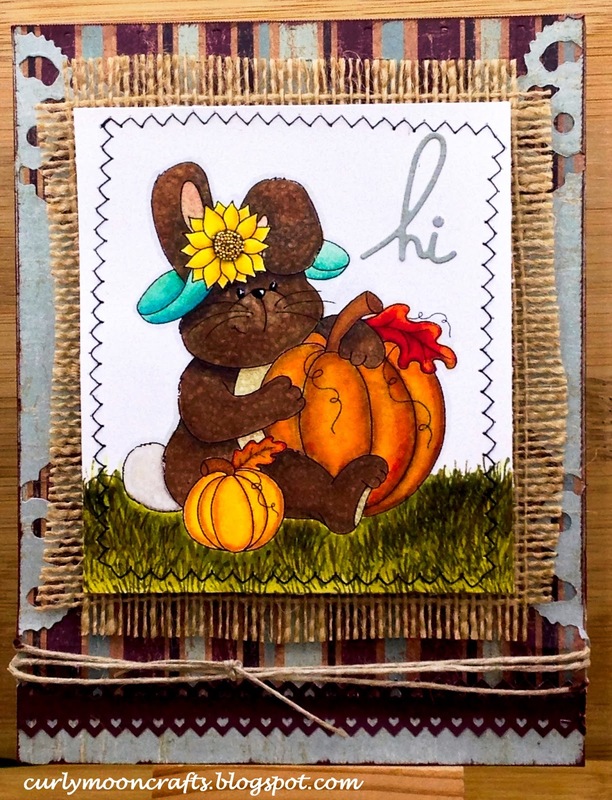 My creation for this week is an Autumn Hello card using the digital stamp Pumpkin Bunny. I printed the Pumpkin Bunny image onto smooth white cardstock and colored it with my Spectrum Noir Markers and used the AI tall grass stamp to add some depth to my grassy area. Then I stitched around the edges with my sewing machine. I covered my card base with the KI papers - selected for their nice fall colors. The base striped layer was embossed with a We R Memory Keepers folder. I used the Distressed Doily die to cut the side stripes and the Border Punch for the bottom strip that covers the paper seam. (The 6X6 papers don't exactly fit the A7 card base - lol!) I wrapped some twine just around the bottom of the card. I wanted to add some texture and a bit more of an autumn feel, so I added the burlap on top of the paper layers, then added the focal panel to the top with some pop dots. I cut the "hi" sentiment from the same KI papers and added it as shown. To finish, I added some Glossy Accents to the bunny's eyes and some microbeads to the center of the flower. Love your card Patti. That image is so darn cute.